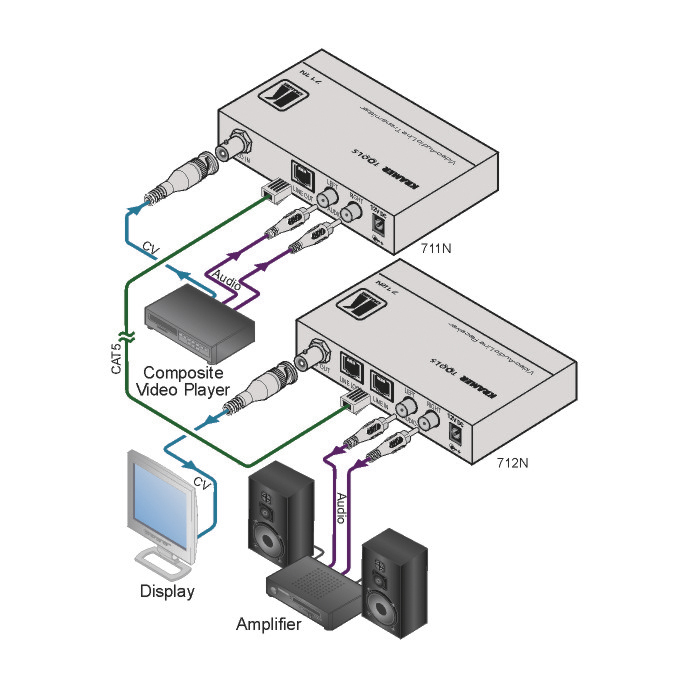 The 712N is a twisted pair receiver for composite video and unbalanced stereo audio signals. The 711N transmitter converts composite video and stereo audio to a twisted pair signal and the 712N receiver converts the twisted pair signal back into composite video and stereo audio signals. Twisted Pair Input/Outputs - RJ-45 connectors. Looping Input - 712N (RJ-45). Selectable Input Signal Termination - 712N. Level (Gain) and EQ (Peaking) Controls - 712N. Power Connect System - A single connection to the transmitter or the receiver powers both units when the devices are within 150ft (50m) of each other. System Range - Up to 400m (1200ft).